Cook a saucy Mozzarella Pasta Bake that's perfect for one person. 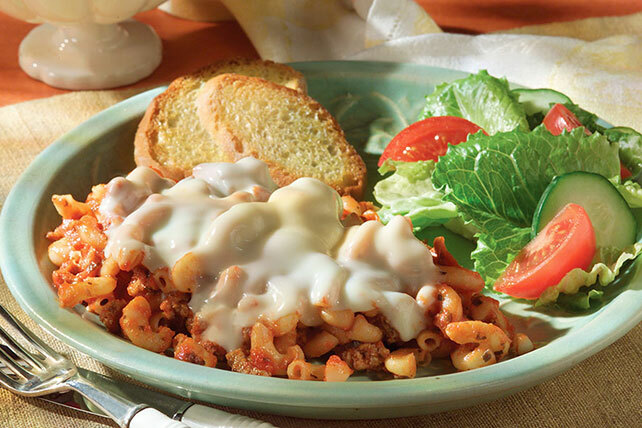 Eat one serving tonight & save the other serving of Mozzarella Pasta Bake for leftovers. Cook turkey in large skillet until done. Stir in pasta sauce, macaroni and Parmesan. Spoon into 8-inch square baking dish. Bake 10 min. or until heated through. Top with mozzarella. Bake 3 to 4 min. or until mozzarella is melted. Cook 3/4 cup elbow macaroni as directed on package in order to get 1-1/2 cups cooked macaroni. Prepare as directed, using small shell pasta. Substitute lean ground beef for the ground turkey.